Driving through Wisconsin this weekend, I saw yard signs. Lots and lots of yard signs. Wisconsin Republicans are energized. 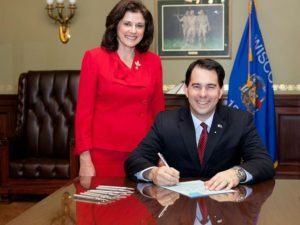 With eight years of incredibly successful Republican leadership to boast about, activists are happy to be campaigning for a third term for Governor Scott Walker, and they are equally happy that one of his key allies in the state legislature, Leah Vukmir, is the Wisconsin GOP’s nominee for the U.S. Senate seat currently held by Tammy Baldwin. The Democrats are energized too, of course. It’s a midterm, and the party that doesn’t hold the White House is always energized in a midterm. The important point here is that Wisconsin Republicans are able to be equally energized, because of the people at the top of their ticket in November. Even if you don’t know your local state rep, state senator, or even congressional candidate, having well known, successful partisan heroes at the top of the ticket has an attraction effect; strong and popular federal and statewide candidates attract volunteers, donations, and voters to everyone down ballot too. Having two-term hero Scott Walker on top of their ticket, Wisconsin Republicans can proudly tie their state reps and state senators to the eight-year Republican reform programs that have been so successful for the once-troubled state. By contrast, the Republican ticket in Illinois, just on the other side of the line, boasts no such surplus of Governor Rauner yard signs, or other excitement, for that matter. Illinois has no U.S. Senate seat up in 2018, so the top of its ticket (after each district’s respective congressional contest) is the race for governor. But while Illinois’ incumbent governor, also running for reelection, is a Republican, he doesn’t inspire the kind of energy or pride in the ranks that his neighbor to the north does. Governor Bruce Rauner was elected four years ago on a promise to bring conservative economics to the Governor’s mansion after a long absence… and as he acknowledged his own differences from the GOP base on other issues, he promised to stick to economics, and to resist any temptation to govern as a liberal in other areas. He did not keep that promise. While Governor Rauner did stay firm on most economic issues – fighting all the way to the Supreme Court to free the state from public employee unions… fighting tax increases… calling for genuine spending cuts, etc. – he wouldn’t leave it at that. Governor Rauner did indeed support the kind of left-wing social engineering that the GOP base had feared from his administration: taxpayer funding of abortions, making Illinois a sanctuary state, approving transgender state identification… the list goes on and on. Governor Rauner is no conservative. Of course, the Democrat nominee, JB Pritzker, is an ultra-liberal extremist, who if elected would be just as liberal on the social issues, but would also be as far to the left on economics as Rauner is conservative on them. JB Pritzker never met a government program he didn’t want to fund – with your money, not his – and he boasts of his plan to impose a massive tax increase on everyone from working folks to the wealthy, through a steep progressive income tax. As a result, Illinois Republicans might have found it in their hearts to get excited for this election, even if based only on how bad JB Pritzker is, and on the need to hold the Governor’s Mansion during the post-2020 census re-districting. But this state’s board of elections – one that never lets an opposition referendum see the light of day, no matter how many petition signatures it gets – has allowed two minor party Gubernatorial candidates on the ticket: Kash Jackson of the Libertarians, and Sam McCann of the independent Conservatives, both of them running to the right of Governor Rauner. This means that the votes of the right are split between three candidates, while JB Pritzker doesn’t have to share the votes of the left with anyone else. By making a Rauner victory that much less likely, much of the Illinois Republican activist base simply can’t get excited about this fall campaign. And downballot candidates – even excellent ones, as many of our state legislative and county board level candidates are – will suffer severely on election day, from this lack of the general excitement that only a popular statewide candidate can bring. The Illinois GOP had a vigorous primary in 2016, with a terrific conservative challenger from the state house leading the charge. State Rep Jeanne Ives attracted armies of volunteers in the primary season, but it wasn’t quite enough to compete with either Bruce Rauner’s money or his campaign’s reprehensible advertising campaign against her. If she had won, the fall statewide campaign would have been a true grassroots effort. 2018 would still be a rough year for a state like Illinois, but the GOP would have had a better chance in many districts, thanks to the general level of activism that only a candidate like Jeanne Ives could have attracted. Unfortunately, not only did Bruce Rauner win re-nomination, he did so in such an underhanded way that many of Jeanne Ives’ primary supporters simply could not bury the hatchet after the dust settled in the spring. Rauner’s tactic may have won him the primary, but it may well have also lost him the general. Worse still, by depressing activist involvement in this election – and likely, depressing turnout on the right as well – the Rauner campaign may end up costing the party much more than just the swing seats normally in jeopardy in a year like this. It could cost the party many state reps, state senators and county board members from districts normally considered safe. It is critical to remember the lesson of 2018 well into the future. The wrong kind of primary, even if the candidate wins, can wind up destroying a candidate’s chances in the general, and more. It was Governor Rauner’s primary ads that did the damage; he will bear the responsibility when voters skip races or skip the election altogether. There’s an old saying: yard signs don’t vote. And it is true. But yard signs are an indicator of excitement, sometimes a very good one, sometimes more dependable than polls. And there is no doubt this year: Wisconsin Republicans did it right, by putting Scott Walker and Leah Vukmir atop their ticket, attracting palpable energy to their statewide effort. Illinois Republicans, sadly, for the umpteenth time, did it wrong again. Campaigns are a team effort; they have to be. No matter how much money they spend, Illinois will likely lose state legislators, county board members, and many other positions in this election, whom they should never have lost, even in an opposition midterm. All because Bruce Rauner couldn’t keep a simple promise or understand the consequences of breaking it, and because his advertising team dreamed up a primary campaign that anyone could have predicted would offend the party’s base in a lasting manner. Primaries have consequences. When the history books address the Illinois general election of 2018, honest writers will recognize what caused the state to suffer a worse midterm than many others. But will Republicans ever learn the lesson? John F Di Leo is a Chicagoland-based trade compliance trainer, speaker, writer and actor. His columns are regularly found in Illinois Review. This column was originally posted on Illinois Review, here.